CRFB has developed a variety of interactive tools to reform the budget, allowing users to see the fiscal challenges lawmakers face and finding the solutions for themselves. The four tools below allow users to look a various deficit reduction policies, comprehensive plans, coprorate tax reform, and Social Security reform. 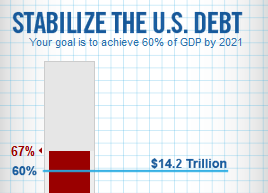 Try solving some of our most challenging budget problems for yourself. Want to secure the future of Social Security? 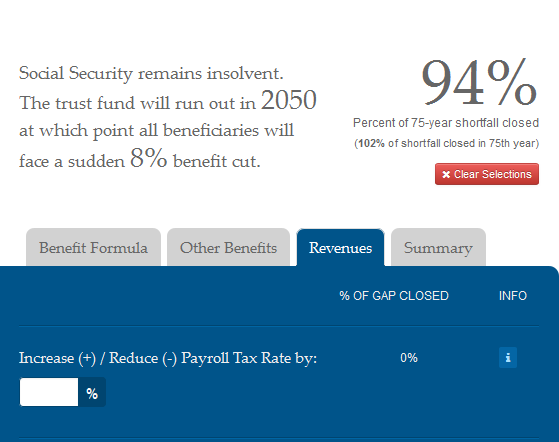 Try the Reformer: An Interactive Tool to fix Social Security. "The Reformer" allows users to select a variety of revenue and benefit changes with the ultimate goal of closing the 75-year shortfall and making it sustainable for the future. CRFB's Deficit Reduction Plan Comparison Tool provides side-by-side comparisons of the many deficit reduction plans that have been developed. This tool is a great way to track and compare all the comprehensive plans that have been proposed to shore up our nation's finances. The Debt Fixer allows users to solve our budget problem and make the the tough choices for themselves.